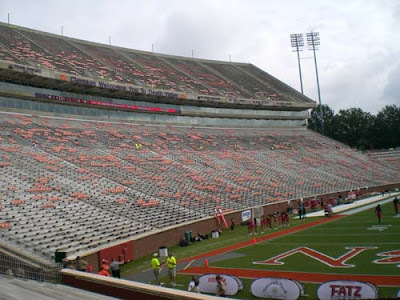 It was a beautiful Saturday to see a Clemson game, overcast with a slight breeze. 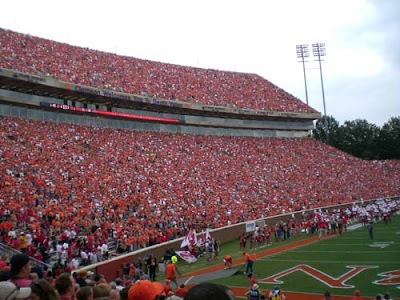 With the game on TV and gas shortages in many areas, I thought the stadium might be rather empty, but people in the South take their football seriously, and Clemson is no different. I went to the game with my father-in-law, and, as we didn't have a need to tail-gate (pecan waffles at Waffle House in Seneca did the job for us) and with a noon start, we decided to go inside the stadium early. And early we were. Not too much longer, however, the stands filled. And the team made it's way down "The Hill," rubbing Howard's Rock at the top with the former coach's words "Give me 110 percent or keep your filthy hands off my rock!" providing an adrenaline rush for the players as they enter the stadium. I won't bore with game minutiae. Despite an impressive first half, even with some errors, the Tigers once again failed. Tommy Bowden, who has done an exemplary job of recruiting, graduating players, and keeping (most) players out of the newspapers for improper conduct, believes in an offensive philosophy that marginalizes team talents and strengths and, therefore, consistently underachieves. The underpinning is that he believes that an offense should take what a defense gives. If the other team stacks the box against the run, it gives better passing opportunities with 1 on 1 coverage. If the other team plays an enhanced pass defense, then a couple good blocks can spring a big running play. Kind of makes sense! On the other hand, when it is known how a team will respond to a defensive set, Clemson coaches in effect let the other team dictate what type of plays they want Clemson to run. It pretty much takes the guesswork out of the defense, and it then becomes an execution issue for both teams. Execution is a coaching issue as well, as it's proven that Clemson loses to teams with good defensive coordinators, or, as in the case of Maryland, a team that is capable of making a single half-time adjustment. 2) a pervasive lack of confidence that a unit can achieve in a difficult situation (lack of toughness). There has been a lot said about Nick Saban at Alabama and the "toughness" he brings to a team. In his second year at the helm, his team demolished Clemson in the season opener 34-10. Clemson once had a coach who believed in toughness and was very successful, Danny Ford. 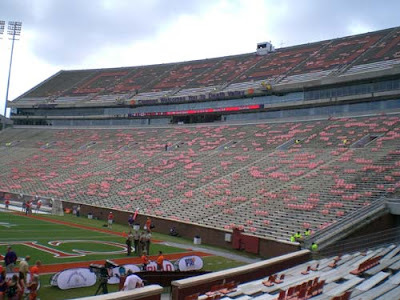 People who love Clemson for non-football reasons cringe at that name. He, like George W. Bush, was not able to articulate to a level that makes constituents proud, particularly problematic for an institution of higher learning. That said, he also knew that to dominate in football, a team has to be able to impose it's will on the other team. That requires toughness, and that attitude, when shared jointly by team and coaches, carries a team through whatever formations another team presents. If toughness in attitude and physicality is lacking, the team may still win some games, but they'll never be winners. The only occasion where Clemson attempts to be "tough" is when the coaching staff has no other choice. 4th and short. Otherwise, their preference consistently lies in "take what the other team gives you." One has to wonder about the level of frustration that exists for players under this system as well, who know they can achieve more. At its core, dominant football requires that a team know they can line up and and knock the other team over, and the opponent has to know it, too. 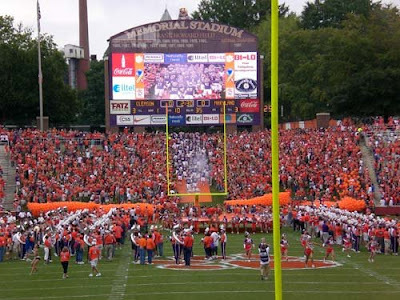 So, in the Bowden era, Clemson fans (and, sadly, very talented teams) take the lumps. 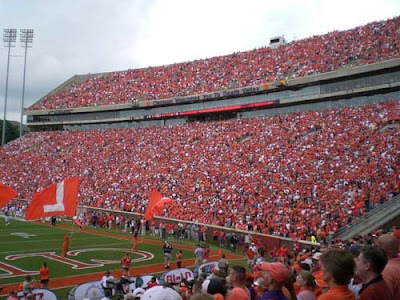 The game-day experience at Clemson, SC remains very special, a return home of sorts with its particular traditions and scenic setting. And later, when ESPN is done telling the nation that based on expectations, "Clemson has to be the biggest disappointment this year," we just have to look ahead for better times to come... and better coaches.